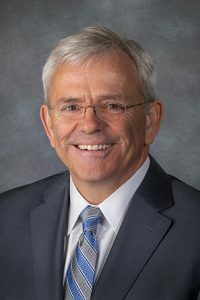 LB309, introduced by Omaha Sen. Steve Lathrop, would add one district court judge, increasing the number in Douglas County to 17. Lathrop said the bill is based on a recommendation by the Judicial Resources Commission to ease the judicial workload. “Having an adequate number of judges is key to making sure the people in our most populous county have [comparable] access to their courts as the people in less populous parts of the state,” he said. J. Scott Paul, president of the Nebraska Bar Association, spoke in support of the bill. At some point, he said, inadequate judicial resources creates a due process problem for people appearing before the court. “In terms of fairness to litigants—not to mention the judges who are trying to do their best—we think that [the situation] could be helped in some small part with one more judge,” Paul said. Douglas County District Court Judge J. Russell Derr also supported LB309. Douglas County conducted 67 first- and second-degree murder trials between 2011 and 2018, he said, while Lancaster County conducted only four. “We understand the budget constraints, but we [need] an additional judge in Douglas County,” Derr said.